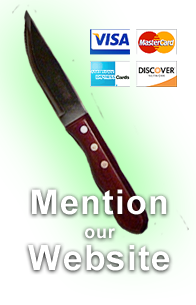 Mention our website when you place your sod order and receive a free sod cutting knife with your sod delivery. Measure the area you intend to sod. Sod is ordered by the square foot. Prepare the ground including installing underground irrigation prior to the arrival of the sod. Sod is perishable and must be installed the day of delivery. Need help calculating your square footage? Use our Sod Calculator. Please place your order well in advance, allowing at least 24 hours of lead time for pick-up orders and 48 hours for orders needing to be delivered to our local zones. More lead time maybe necessary during our busy season. When you call to place your order, please be prepared with the following information: Name, address and telephone number of both the ordering party and the deliver-to party, as well as clear, concise directions to the delivery site. Prepayment with a debit/credit card or cash on delivery. 24 hour cancellation notice required. If there is a problem with our sod, please notify us within 48 hours. There is a 500 square foot minimum for local sod deliveries. A $75.00 drop charge will be added to any delivery order under 1000 square feet. Sod is delivered throughout Oregon and SW Washington. Higher square footage minimums and longer lead times may apply for areas outsize our local zone. There is no minimum for sod orders that are picked-up from the farm. Even if all you need is one piece of turf we can help. There is a $15.00 deposit on each pallet, refundable when the pallets are returned to the farm.